Indianapolis, IN- Want to find out how fast you really are in your rotary vehicle? In 2004 a lot of male attendees felt they were pretty fast on our autocross course. And yes, there were some decently quick times throughout the day. So, we decided to throw down the gauntlet and challenge all of our attendees to see how they compare to a ringer (or two). Lateral G proudly welcomes Beth McClure-Strelnieks for her first appearance at the Rotary Revolution. Now we can already hear our past autocross winners scoffing, so let us bring Beth's credentials to the table. Impressed yet? Ready to see how well you run against a former champ? Well be prepared because when she decides to take a breather and spend some "quality time" with the attendees we're going to let her husband Erik get behind the wheel (he THINKS he can beat Beth's times). It's all in good fun, so come on out and compare your times on our two autocross tracks to Beth and Erik, and help us welcome them for their first appearance at the Rotary Revolution! Discounted online registration for Rotary Revolution 2005 has begun and will run through March 15th, 05. As many of you know, there will be 2 autocross tracks this year. Our team of three track designers just finished the layouts for next year’s courses. In addition to much shorter lines and improved traffic flow, the new courses were designed to test entirely different aspects of your driving skills. Track one is in the same location as in past years. It has been lengthened and expanded to give you more driving time. The second track incorporates a portion of the road course with a long sweeping turn. Standard track on the left. Track with a portion of the road course on the right. If I am not in desert, I wll bring my FD and compete. I am no national champion but I still race SS and proudly beat Z06s when I race. I will be excited to see the more experienced drivers race. Count me in. I signed up for the Revolution but I didn't see a spot for autocrossing. Does anyone know where to sign up? 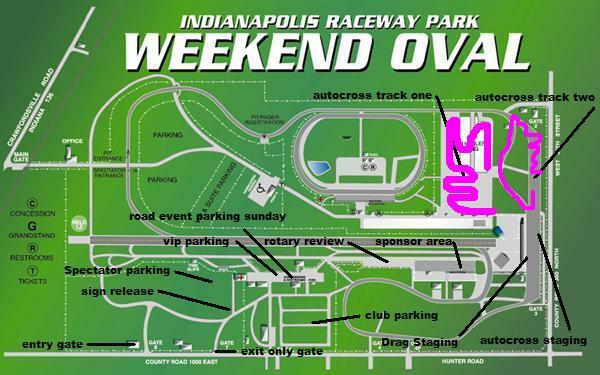 Dan, the two autocross tracks, two days of drag racing and seminars are all included in the basic registration fee. On Saturday you will just get in your car, pull into the staging lane and decide if you are going to drag race the car, challenge autocross track 1, or challenge autocross track 2. Are we goin to need to have helmets for autocross this year, or will it be like last year, No helmets required. Quick Reply: Autocross Challenge at the 2005 Rotary Revolution!